Now that we know that Neandertal-introgressed DNA had (deleterious) functional consequences for modern humans, I think we also need a study on "useful stuff" conferred by Neandertal admixture. 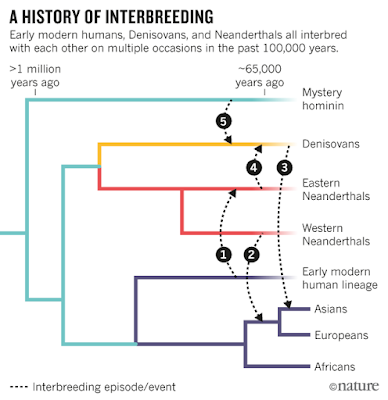 So far, the Neandertal genome has been used (mostly) as our closest relative, in order to identify novel gene variants shared by all modern humans but absent in Neandertals: the goal is to find things that "made us special". Pickings of this search have been slim. Doubtlessly, as we begin to better understand the genetics underlying positive human traits, some of these will end up having come from archaic humans. Neandertal admixture was a huge injection of "new stuff" into the Eurasian modern human gene pool, and there is every reason to think that even if the "bad stuff" outweighed the "good", there was still plenty of room for functionally beneficial variants to be acquired from them. Corinne N. Simonti et al. 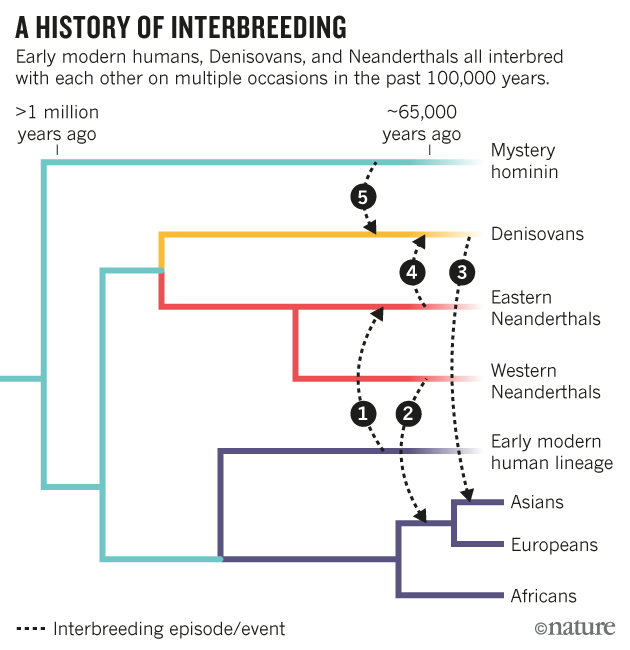 Many modern human genomes retain DNA inherited from interbreeding with archaic hominins, such as Neandertals, yet the influence of this admixture on human traits is largely unknown. We analyzed the contribution of common Neandertal variants to over 1000 electronic health record (EHR)–derived phenotypes in ~28,000 adults of European ancestry. We discovered and replicated associations of Neandertal alleles with neurological, psychiatric, immunological, and dermatological phenotypes. Neandertal alleles together explained a significant fraction of the variation in risk for depression and skin lesions resulting from sun exposure (actinic keratosis), and individual Neandertal alleles were significantly associated with specific human phenotypes, including hypercoagulation and tobacco use. Our results establish that archaic admixture influences disease risk in modern humans, provide hypotheses about the effects of hundreds of Neandertal haplotypes, and demonstrate the utility of EHR data in evolutionary analyses. The fact that UP Europeans had mtDNA haplogroup M really destroys any lingering justification for a coastal migration that first brought (M, N) to Asia and then a subset (N) into Europe. Another justification for the "Asia-first" model was the presence of Y-haplogroup C in Australians and Asians. But, that too was found in UP Europeans (K14). 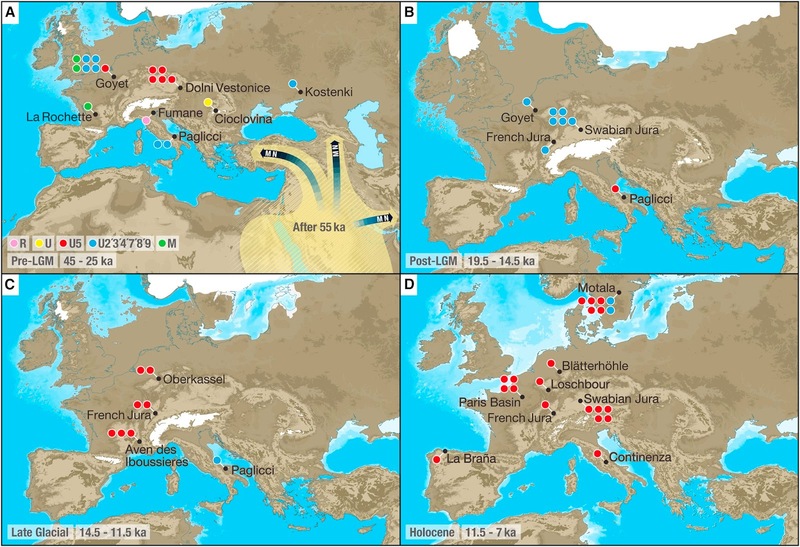 So, I think things are looking good for my theory that Eurasians came out of Arabia northwards, interbred with Neandertals, headed both west and east, populating both Europe and Asia. The inferred date for both M and N (55kya) is on the cusp of the 50kya technological transition. In European hunter-gatherers, our model best explains this period of upheaval as a replacement of the post-LGM maternal population by one from another source. Although the exact origin for this later population is unknown, the inferred demographic history (Figure 3 and 2b in Figure S2) suggests that it descended from another, separate LGM refugium. Where was this LGM refugium? Exactly where this new population came from is still unclear, but it seems likely that they came from warmer areas further south. 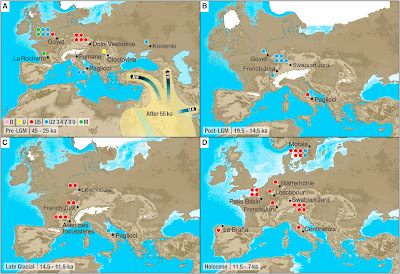 “The main hypothesis would be glacial refugia in south-eastern Europe,” says Johannes Krause at the Max Planck Institute for the Science of Human History in Jena, Germany, who led the analysis. Understanding patterns of genetic diversity is a crucial component of medical research in Africa. Here we use haplotype-based population genetics inference to describe gene-flow and admixture in a collection of 48 African groups with a focus on the major populations of the sub-Sahara. Our analysis presents a framework for interpreting haplotype diversity within and between population groups and provides a demographic foundation for genetic epidemiology in Africa. We show that coastal African populations have experienced an influx of Eurasian haplotypes as a series of admixture events over the last 7,000 years, and that Niger-Congo speaking groups from East and Southern Africa share ancestry with Central West Africans as a result of recent population expansions associated with the adoption of new agricultural technologies. We demonstrate that most sub-Saharan populations share ancestry with groups from outside of their current geographic region as a result of large-scale population movements over the last 4,000 years. Our in-depth analysis of admixture provides an insight into haplotype sharing across different geographic groups and the recent movement of alleles into new climatic and pathogenic environments, both of which will aid the interpretation of genetic studies of disease in sub-Saharan Africa.